Elisha Graves Otis did not start out with the intention of inventing elevators. It all began because in 1852, according to The Sun half a century later, he became tired of lugging heavy materials between floors of the bedstead factory in Yonkers where he was superintendant. Otis set about constructing a freight hoist. Although variations of hoists and elevators were already in existence, this one had a significant difference. Otis devised a brake that would automatically engage should the rope break; preventing the platform from crashing to the floor. 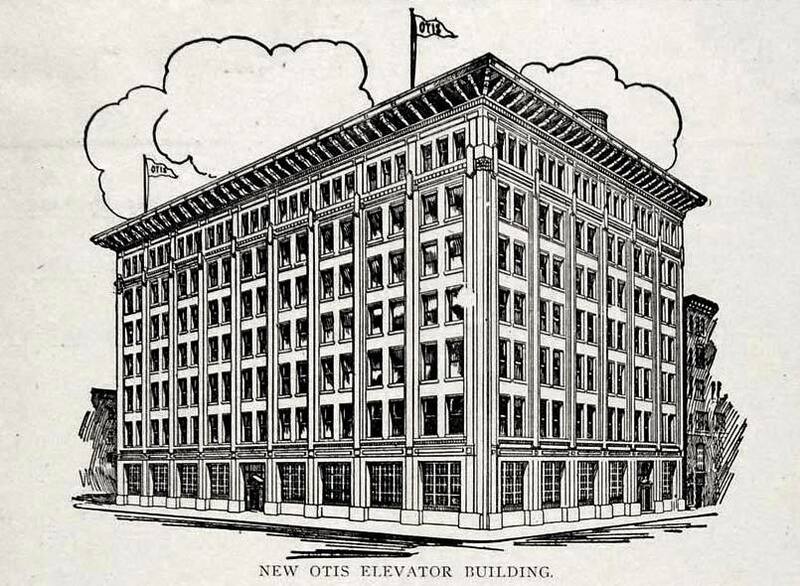 As word spread, Otis began building similar elevators for local merchants. By 1854, as he opened his first factory in Yonkers, he had given up bed making and turned his attention solely to the manufacture of elevators, establishing the E. G. Otis Company. That year he not only opened his first factory in Yonkers but managed to astound the masses at New York’s Crystal Palace international exposition. Although marketing would prove to be one of his weak points, Otis outdid himself here. He stood confidently on the elevator floor as the contraption was elevated high into the air. The inventor then sliced through the rope as Victorian women gasped below. The safety brakes immediately deployed, stopping the elevator from falling. “Otis” and “elevator” were soon nearly synonymous. 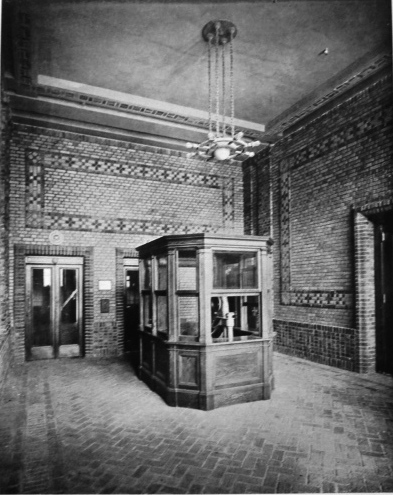 In 1857 the Otis firm installed the first passenger elevator in the elegant new E. V. Haughwout Building on Broadway. In 1897, the same year that the firm installed the first electric-powered elevator in the Demarest Building, it came to the rescue of the Paris Exposition's Eiffel Tower. French engineers were baffled by the angled legs of the tower--elevators by nature required a straight shaft. In exasperation and with time running out before opening, they turned to Otis Brothers & Co. (Elisha Otis had died in debt in 1861) who solved the engineering problem. Unlike their father, brothers Charles and Norton Otis were brilliant admen. 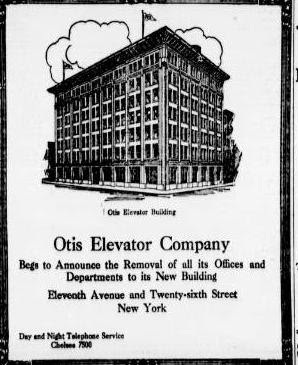 The new buildings with Otis elevators--each one taller than the last--were used as marketing tools in Otis advertisements. The firm continued to grow and, to eliminate competition, bought up competing companies. Two separate law suits, about a decade apart, along with increased government anti-trust regulation, forced Otis to consolidate is many related companies into the Otis Elevator Company in 1906. Part of the outcome of the last anti-trust case was an attempt on the part of Otis to regularize its operations. A central headquarters building would help accomplish this. In 1909 the Otis Elevator Company purchased land in the industrial neighborhood of 11th Avenue in Chelsea from Ambrose K. Ely. On the stretch of avenue between 26th and 27th Streets an elevator works (possibly already Otis) occupied a former iron works building. 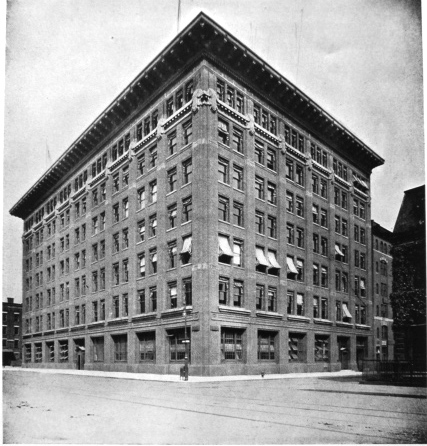 Otis commissioned the architectural firm of Clinton & Russell to design a multi-purpose headquarters building here. The firm, established in 1894, had already designed numerous New York City business buildings. The structure included functional departments on the two lower floors: a garage, stock rooms and machine shops, and the service department where factory-trained technicians handled replacement parts and repair problems. The upper five floors contained the company offices. The remote location prompted the inclusion of conveniences for the staff: there was a dining room, pantry, baths, a barber shop and a law and patent library. “This concentration under one roof will greatly facilitate the business of the Company and provide for the benefit of users of Otis Elevator products the most complete Supple and Service Organization of any elevator company in the world,” wrote The Western Architect. The year that the doors to the new building were opened, Otis installed the elevators in the world’s tallest building, the Woolworth Tower. Year after year architects and engineers came to 260 11th Avenue to arrange elevator service for new structures: The Empire State Building, The Chrysler Building, Chicago’s Sears Tower among them. In the meantime, Otis engineers constantly worked on innovations to keep the firm on the top of the elevator heap. From here came ground-breaking inventions such as the push-button elevator and automatic doors. Otis Elevator Company remained in the 11th Avenue headquarters for seven decades, finally moving to Midtown in 1974. The building that had been built and used as the home for a single firm was leased out over the years to smaller factories and offices. For the young and trendy New Yorkers of the late 1970s and early 80s, No. 260 11th Avenue would be known as Les Mouches. The multi-level disco/supper club/cabaret was on the upper floors and its gargantuan dance floor was the scene of frenzied dancing under miles of lights, upscale dining and celebrities both on stage and in the crowd. On Saturday nights in 1980 Patti LuPone went directly from the Prince Edward Theatre to perform at Les Mouches (named after Jean-Paul Sartre’s play The Flies); a year later Maureen McGovern played here after her performances of The Pirates of Penzance; as did Julie Budd and the Bee-Gees. In the audience a patron could rub shoulders with celebrities as diverse as Grace Jones and Phyllis Diller. By the mid 1980s Les Mouches was gone, replaced by Chippendales. The days of thumping music, glinting disco balls and scantily-clad muscle boys passed on. The Otis Elevator Building is once again filled with a variety of small businesses and factories. But Clinton & Russell’s striking 1912 exterior design remains nearly completely unchanged. Really loved the architecture of the building..Its really an amazing one.. The Otis globe was inlaid in the floor of the lobby, and two (2) escalators go from that lobby up to the second floor (Otis Engineering)symbolizing a company leading right to the engineering excellence. Very interesting! So much more information that I had ever known about this building. Thank you for the research, photos, and posting.